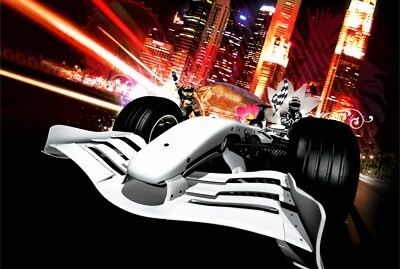 The 2010 grand prix grid could be fuller than a NSW State school if all the teams that have entered actually turn up. David Richards' Prodrive organisation has joined USF1, Lola, Campos and Litespeed GP in lodging entries for the 2010 Formula One world championship. And FOTA - the Formula One Teams Association - has confirmed that the nine remaining outfits currently on the grid - Ferrari, McLaren, BMW, Renault, Toyota, Brawn, Red Bull, Toro Rosso and Force India - have joined Williams in submitting entries to the FIA for the 2010 F1 season. But Ferrari team chief Stefano Domenicali has emphasised that the FOTA teams' decision to lodge entries for 2010 isn't an indication that they are prepared to accept the FIA's budget cap. The FIA hasn't yet announced which new teams have been accepted into the world championship. If everything proceeds in a positive fashion, then F1 should have a full grid of 26 cars next year. FOTA has said in a statement that the entries are conditional on a new version of the Concorde Agreement being signed by June 12 - at which point the existing 10 teams would commit irrevocably to F1 next year. The teams have also demanded that the rules for the 2010 season be based on the current 2009 regulations, amended in accordance with proposals that FOTA has submitted to the FIA. "The renewal of the Concorde Agreement will provide security for the future of the sport by binding all parties in a formal relationship that will ensure stability via sound governance," the statement went on. "All FOTA teams' entries for the 2010 FIA Formula One World Championship have been submitted today on the understanding that (a) all FOTA teams will be permitted to compete during the 2010 Formula One Season on an identical regulatory basis and (b) that they may only be accepted as a whole. "All FOTA teams now look forward with optimism to collaborating actively and productively with the FIA, with a view to establishing a solid foundation on which the future of a healthy and successful Formula One can be built, providing lasting stability and sound governance." Some mainly manufacturers' teams - among them Ferrari, Renault, Red Bull and Toyota - had publicly questioned their future F1 participation because of the FIA's proposed optional 40 million pounds budget cap and two-tier regulations which FIA president Max Mosley was intent on locking in for 2010. The teams (through FOTA) had already been investigating means of capping expenditure but were against the idea of making it optional, leading to the two lots of regulations - one more restrictive set for the big and rich outfits and another freer technical rules structure for the budget sensitive "capped" teams. Both sides - the FIA and FOTA - now seem to be working to a solution with a potentially ideal outcome of a reduction in teams' expenditure AND an appealing technical structure that lures to new privateer entries. Richards has some unfinished business in F1. He did well when he was overseeing BAR's campaign, being there for the team's for and only victory, and Jenson Button's maiden victory. Eighteen months ago, Richards and Prodrive were poised to enter F1 with the plan of using a customer McLaren chassis, but that idea turned to dust in the heated dispute over the legitimacy of customer cars. But with Mosley and the FIA bulldozing ahead with a cost cap for F1, the sport has become a realistic option for Prodrive and other engineering-based teams. "We are very appreciative of the support we have been given in putting together our entry, not least by both the FIA and FOM," Richards declared at the time of the announcement. "With the help of Dar Capital, in raising the finance, coupled with our understanding of the latest proposals to assist new teams, we now feel the conditions are right to formally request the FIA for an entry. "The level of next year's cost cap has risen substantially since we originally considered entering. However everyone appears committed to major reductions in future years and when one takes into account the transition proposals for new teams we are confident that we now have the opportunity to be both commercially viable and competitive. As we have said all along, we don't want to be in Formula One just to make up the numbers." The entry is currently from Prodrive, but there is strong speculation that it may switch to the Aston Martin name down the track. Richards is the chairman of Aston Martin. The new F1 rules for 2010, while very much a moving picture right now, also appear poised to give engine supplier Cosworth a re-entry to the world championship. The new USF1 wannabe team based in Charlotte, North Carolina, and owned by Peter Windsor and Ken Anderson, seems set to use Cosworth engines.